MACOMB, IL -- Casa Latina at Western Illinois University will celebrate Dia de los Muertos (Day of the Dead) from 6-8 p.m. Thursday, Nov. 2 at the Multicultural Center. 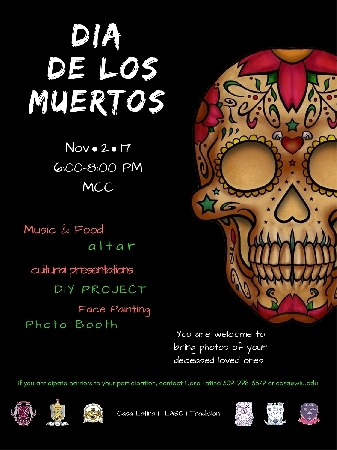 The celebration will include history of how Dia de los Muertos is celebrated, music and food, cultural presentations, face painting and a photo booth. Guests are welcome to bring photographs of their deceased loved ones. Organizaitons will be selling a variety of food items, including chicken flautas, conchas (Mexican sweet bread) and abuelita hot chocolate. The event is sponsored by Casa Latina, the Latina American Student Organization, Tradicion and the Latino Greeks. For more information, call (309) 298-3379 or email casa@wiu.edu.